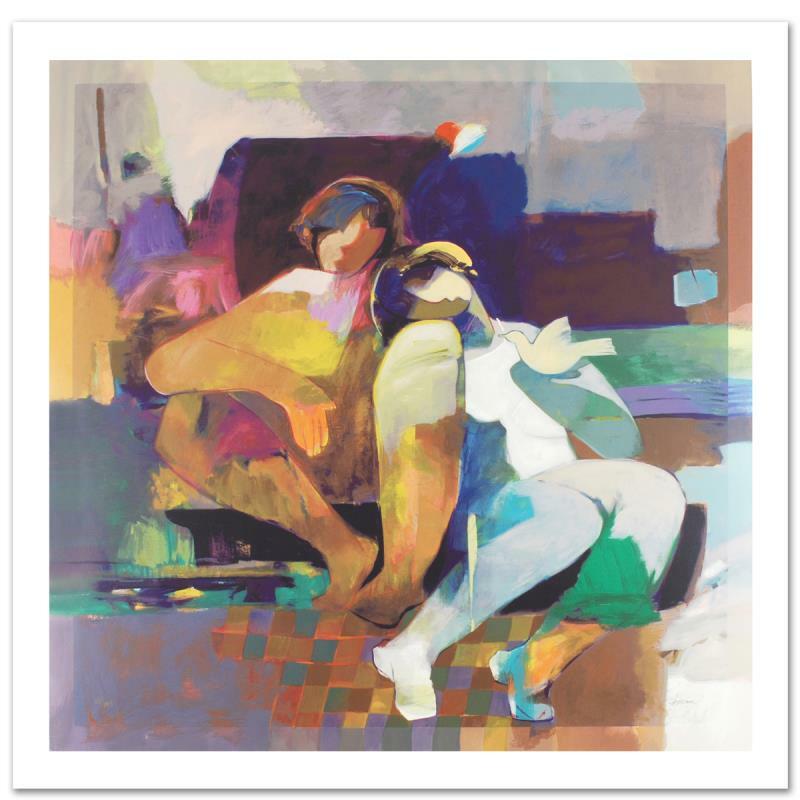 Hessam Abrishami "Tender Shoulders" Limited Edition Serigraph on Canvas, Numbered and Hand Signed; Certificate of Authenticity. 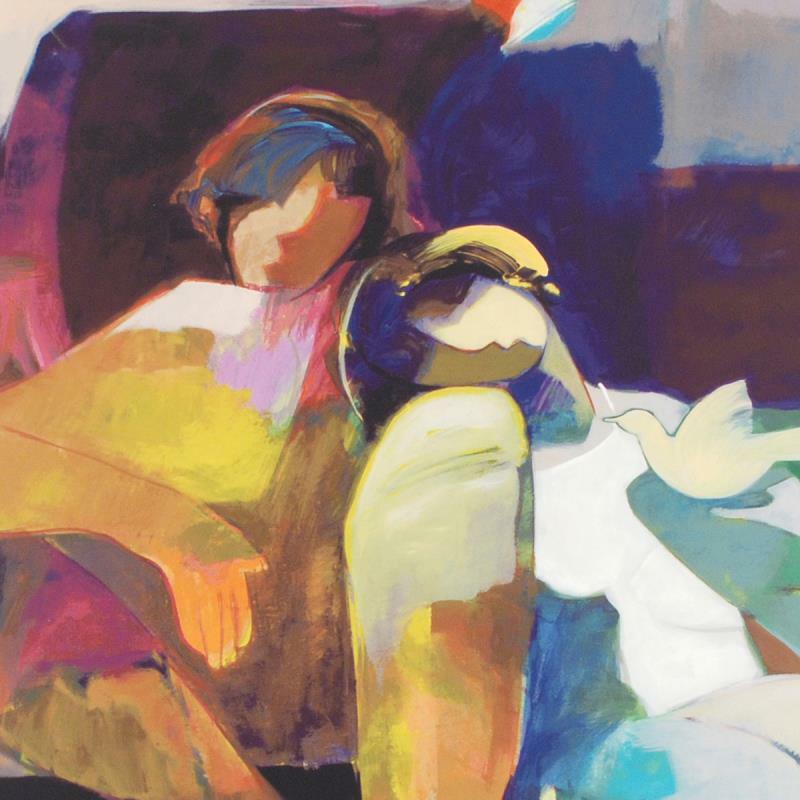 "Tender Shoulders" is a limited edition serigraph on canvas by Hessam Abrishami, numbered and hand signed by the artist. Includes Certificate of Authenticity. Measures approx. 36" x 36" (image). Hessam Abrishami was born in 1951 in the city of Shiraz, Iran. At the age of fifteen, one of Hessam's teachers, who was himself an artist, helped him to discover his passion for painting and art. From that point on he pursued his passion for painting and other forms of art including calligraphy and architecture, while finishing school. By the age of seventeen Hessam won his first award for his painting in a student competition, and at nineteen he got first place honors in the "Iranian New Artists Competition." In 1975 he went to Perugia, Italy, considering the area to be "the center of art in Europe" and attended the Accademi De Belle Arti "Pietro Vanucci," receiving a Masters Degree in Fine Arts. Hessam continues to paint, inspired by his more dramatic life experiences. Using his medium of choice, acrylics, he continues to explore a realm that the French Press has called, "a statement in the fluidity of human figures." Hessam's works - exhibited in Asia, Europe, and North America - have been described as "taking the onlooker to a realm of suggestion and mystical beauty...where everything is alive with a sense of everlasting fluid motion."